The Sinclair ZX Spectrum turns 30! 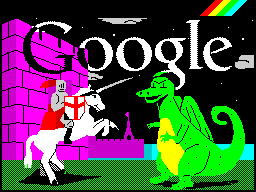 Today Google UK dedicates the daily doodle to the 30th birthday of the ZX Spectrum. I am part of that generation that learned to love computers/programming playing games like Manic Miner on an 8-bit little console with rubbery keys. The machine was so simple and ingenuous that you could get the entire schematic at a single glance and you could literally know every single line of code in the BASIC rom. My tribute to that lost (romantic?) era: an emulator for the PIC32 written entirely in C from scratch that runs the original games in almost real time (a bit faster actually) on a Mikroe Multimedia Board. This entry was posted in PIC32 and tagged PIC32, ZX Spectrum. Bookmark the permalink.